The first Owners Week of 2019 begins Saturday, February 2! Starting at 7 a.m., a digital coupon for 15% off one shopping trip is added to every Co-op Owner’s account, and you choose when to use it. Build your list, fill your cart, and then tell your cashier that this is the trip you want to save 15% on! Owners Week ends at 9 p.m. on Sunday, February 10. Rain checks will be available for some items - ask a Co-op Staff member for details or call (208) 882-8537. Not an Owner yet? 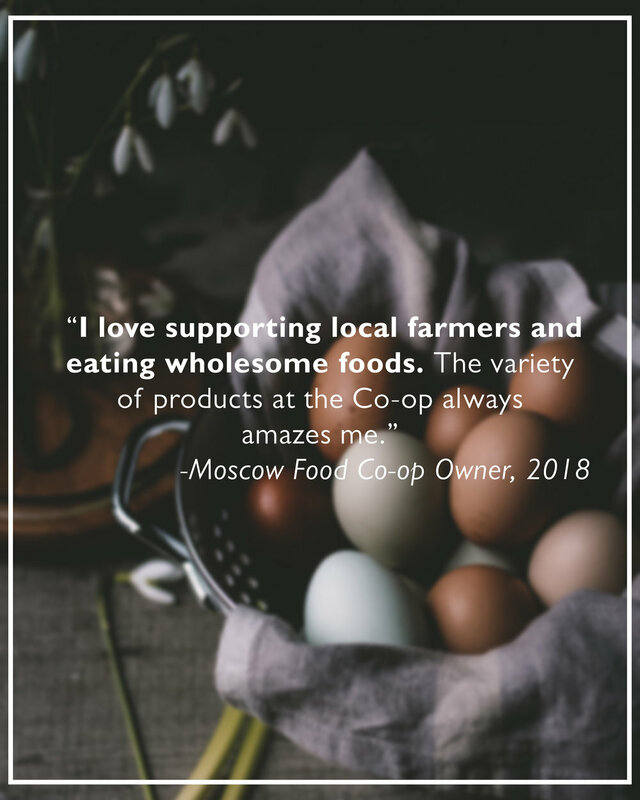 Ask your cashier to start your ownership today and you’ll join the thousands of people in the inland Northwest who own shares of the Moscow Food Co-op. During your visit just let your cashier know that you would like to join! It takes about one minute at any check stand, and then you'll own part of a locally grown and democratically guided food cooperative. The investment costs just $10 for one year of ownership. (Some owners choose to pay $150 and become "lifetime owners" -- after 15 years of ownership, you'll automatically become a lifetime owner.) That $10 will be added to your transaction, and you'll get your brand-new Owner card! Free or reduced prices for films and classes. LOCAL INVESTMENT. 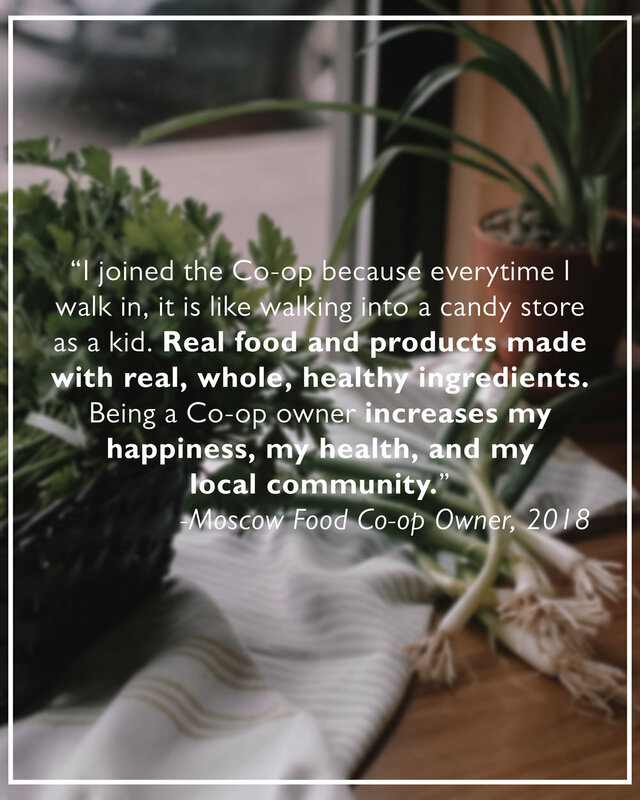 Your $10 payment to become an owner for a year is a true investment in the Co-op and its future. This investment, your "equity", helps build your store. For example, owner equity helped us pay for our salad bar, energy efficient lighting, bakery ovens, and so much more! Your equity is designated for store improvements and is not taxable to our Co-op. LOCAL CONTROL. Owners shape the Co-op. Because cooperatives are democratic, each owner gets one share and one vote. Owners have an equal say in what we do and the opportunity to vote for or serve on the Board of Directors. You also can volunteer for community projects or committees that shape the Co-op. When we're profitable, owners may receive a refund based on their spending. Consumer cooperatives can return to their owners a percentage of the net profit from owner activity. This refund is based on how much individual owners spend at the Co-op. To qualify for a refund owners just shop using their accounts, and each owners' refund will be calculated based upon their total patronage for the year. The Board of Directors votes on patronage refunds and the refunds are distributed for the previous year's activity. Some years we have enough profit to return a portion to owners, and some years we do not. You own it, so why not pitch in? Click here to learn about becoming a Participating Owner and earning up to 18% off when you check out at the register. 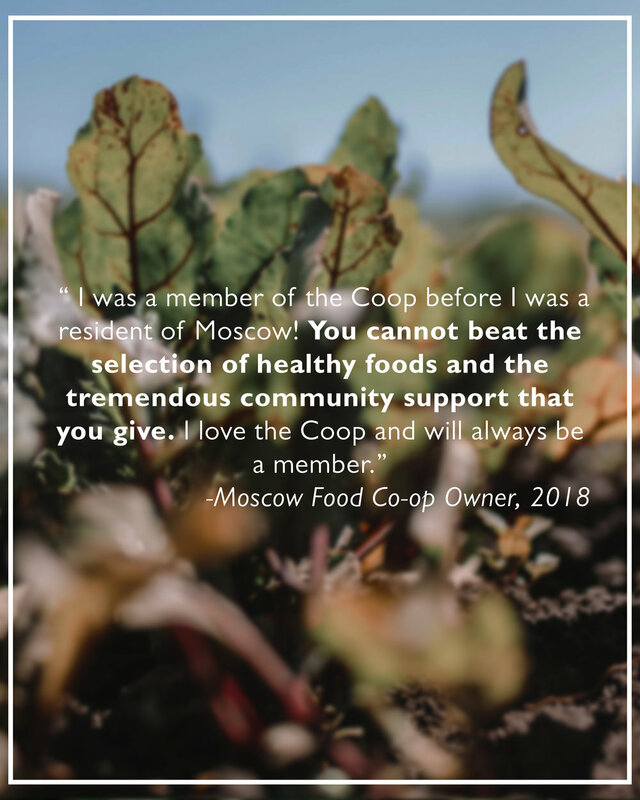 If you have any questions about ownership benefits, rights, and responsibilities, please contact ownerservices@moscowfood.coop or call (208) 882-8537. Already an owner? Update your information here!